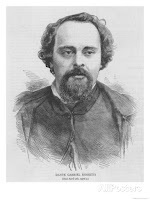 Dante Gabriel Rossetti (1828—1882) is a painter and poet who was born in London to Italian expatriate parents. He is only one of the Rossettis to have left his mark: His father was renown as a Dante scholar, his brother William Michael Rossetti was an influential art critic, and his sister Christina Georgina Rossetti is one of the leading poets of the nineteenth century. In 1848, Dante Gabriel Rossetti and some friends founded the Pre-Raphaelite Brotherhood, a group of British artists who valued "truth to nature" in painting through attention to minute details, and symbolic imagery. His Sonnet sequence, "The House of Life", from Ballads and Sonnets (1881) is considered by some to be his finest poetic achievement. Of the soul-filling, life-giving board. And even the burthen of shame. And much lighter to lift at the stile. Warmth in frost, and a breeze in the heat. Of my Lord, which is Christ, which is God.